I wrote this on July 27, 2010. And I hoped it wasn’t true. But you can’t fool astrology and especially Xtrology. It has been announced that Chelsea Clinton’s husband (I’m not going to mention his name) has taken a leave of absence from his job at 3G Capital to go skiing at Jackson Hole, Wyoming for, you’re not going to believe this, three months. We can hope this is not the end of the marriage, but as Xtrology predicted, it’s a really bad sign based on their astrological incompatibility. He’s not totally to blame. Both of these people got married for the wrong reasons. And when you do that, you will get the wrong results. Every time. I see it over and over in marriages. There is only one reason to get married — you cannot imagine living without this person. Apparently, you-know-who can live without Chelsea. 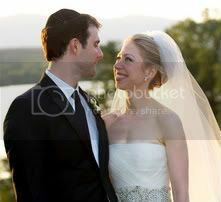 There is only one thing driving the union between Chelsea Clinton and Marc Mezinsky — a Sun (hers in Pisces) Moon (his in Pisces) connection that I have seen so often make people think they are in love. They will even say it is fated. But it’s simply not enough to make a marriage or even a relationship work. Dare I say, Chelsea is a Pisces and Marc a Sagittarius. Never, and I do mean never, marry your square (Pisces squares Gemini and Sagittarius) and (Sagittarius squares Virgo and Pisces). The communication is beyond off. It’s like talking to someone from a different planet. As if that were not enough, Marc has four focal planets (two planets oppose and the focal planet squares both) making him a complex individual that is hard to understand by anyone, but especially a sign that squares his and has Neptune (fantasy, delusion) as a focal planet. At least the wedding will be beautiful and expensive. I hope the Clintons are paying back a lot of favors, because this marriage should go south quickly. Chelsea’s progressed Mars (rips your life into tiny little pieces) is square Uranus (upsets) and getting ready to square Venus (love) while Venus already opposes Uranus. These aren’t love aspects! So what’s going on here? This little Neptune girl is thirty. I’m guessing here. Getting desperate? She has her Master’s Degree. She’s smarter than this. The lovely transiting Jupiter/Uranus in Aries is conjunct her Venus in Aries. How nice that would be if transiting Saturn and Mars weren’t opposing in Libra and Pluto in Capricorn squaring them all. So we’re hoping at least Marc loves Chelsea. Venus is one of his focal planets so he really doesn’t think anyone loves him. His Sun is a focal planet so he thinks he can push Chelsea around (and he probably can for awhile). Neptune is another focal planet so he’s pretty disillusioned about what he’s about to accomplish. And finally Pluto, all about the right and wrong of it. Well, this is just plain wrong. Marc only has Sun inconjunct (something needs adjustment) Jupiter, but still you would like to see a nice Venus or Jupiter progression for someone to get married and in such a public way. Marc my words. This is over before it’s begun. Maybe someday people spending $2 million dollars for a wedding will spend $200 (to be honest, if that ever happens, it will probably be a lot more expensive) to get my opinion. Chelsea is going to be much more upset (she’s a sensitive water-sign Pisces) than la-ti-dah Sagittarius. She has everything to lose, and he’s going in the history books. When I saw the headline on a tabloid at the grocery store last week, I remembered your prediction at the time of Chelsea’s wedding last summer. Great work!!!! This is an interesting subject. will they stay married or not? I saw the headline from “The Star” one of those trashy newspapers that write stories about the famous and celebrities going through divorces that never happened. Along with The Star, The National Enquirer, The Examiner, The Globe do write fictional stories. These very newspapers have been sued so many times, I am surprised they are still standing and doing business. again, look at the world the way it is today, and everybody wants to read trash and think there is truth to it. I did quickly scanned the other legit magazines and there was no mention of them divorcing or separating. I think they will have a long and happy marriage. the first year of any marriage is the hardest. I wish them well, and they deserve happiness like everyone else.